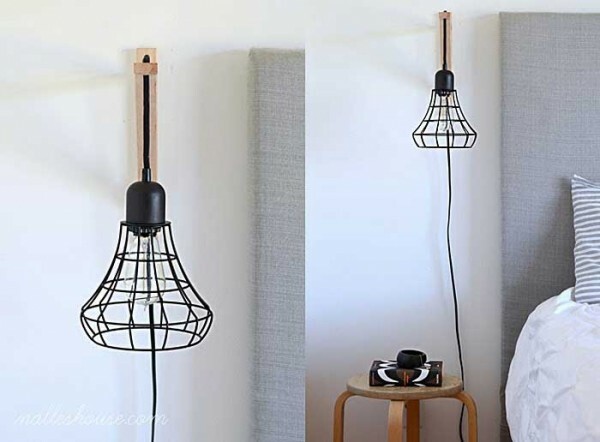 I never can get enough of all the cool ideas there are for making unique lampshades and light fixtures. It makes me wonder why I still have some basic globe style fixtures in my house. There is really no excuse. Even if it is just a hallway or bathroom ceiling, I really could be having a lot more fun with those. I did make a pendant light made from a vintage sifter. It didn’t take long for me to look at that sifter and think of it in a new “light” because of it’s shape. The shape makes a perfect pendant fixture when turned upside down! There are plenty of other items that also have that perfect light fixture or lampshade quality. 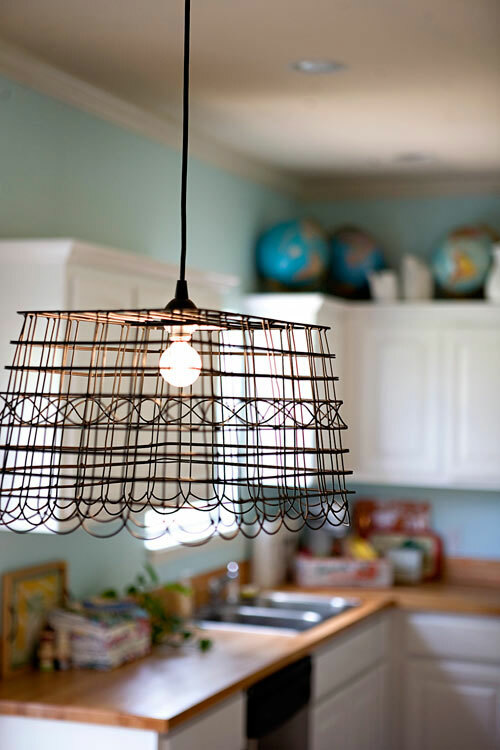 Here is a fantastic Anthropologie inspired pendant light made from a wire basket. The step by step tutorial is easy to follow! Because the project is budget friendly, it makes a great alternative to buying new. Another take on this idea is to use two round planter baskets for a diy light. Check out how this light is hanging! The pulley idea is right up my alley. 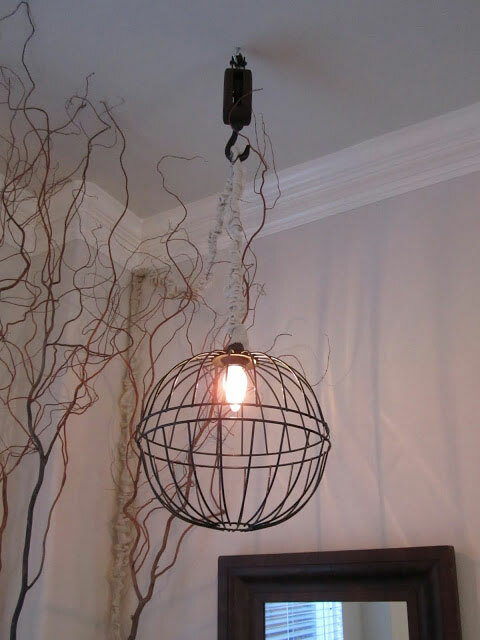 A common cage light suddenly looks industrial chic when it is hung like a pendant light. Check out the step by step tutorial for making this conversion. 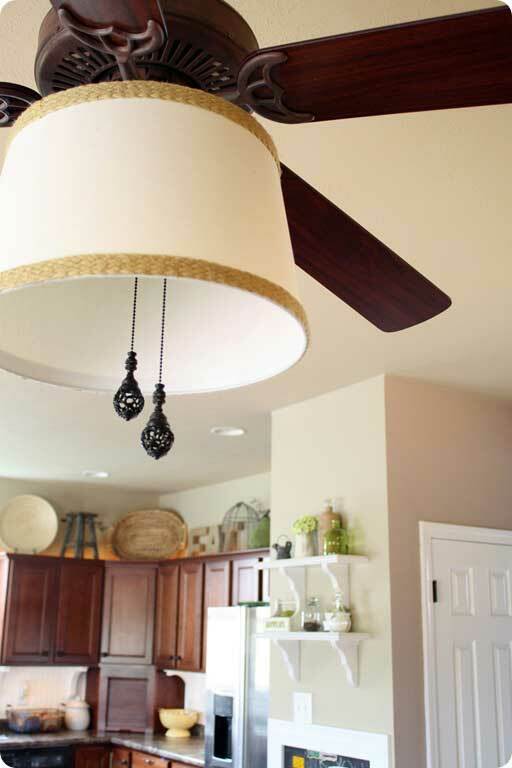 And, how about dressing up a ceiling fan? A chic drum shade added to the light ramps up the style factor big time. This light shade is an easy DIY project. 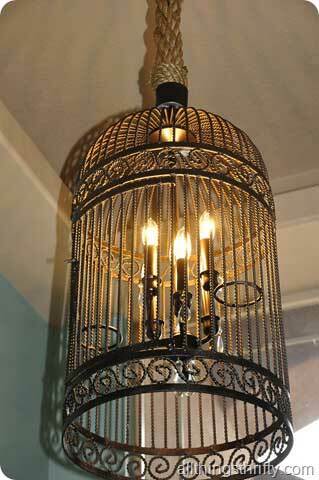 Here is a Restoration Hardware knock of a birdcage chandelier done by All Things Thrifty. Instead of costing $2300 it was made for around $60. You will want to check out the tutorial! I actually really like the shade! Thanks for the tutorial.